Friday night: Clear. Cold. Watch out for black ice. Lows in the low 30s. Saturday: Sunny. Pleasant. Highs in the mid 40s. After a quick hitting burst of snow, and then a change to rain for many, our storm is rapidly lifting into Canada. That means the rain and snow will end by noon Friday in much of Southern New England, with peeks of sunshine after that. In Northern New England, the snow will more gradually wind down during the afternoon. Temperatures will gradually drop into the 30s and 40s behind the storm, so there will continue to be slick spots north and west of Worcester in particular. Overnight skies will continue to gradually clear with lows in the 20s and 30s for most. Icy spots will redevelop as a result. This weekend brings a mixture of sun and clouds, with the most clouds over the mountains and more sun in Southern New England. Highs will reach the 40s on Saturday but will drop into the 30s to near 40 by Sunday. A weak disturbance comes through New England on Monday, producing some light rain and snow showers. This should not be enough to cause major travel issues. Highs will start the week in the 40s, but then another front comes through with a few flurries late Tuesday into early Wednesday. That provides a reinforcing shot of cold air, meaning highs by Wednesday will only be near 30. 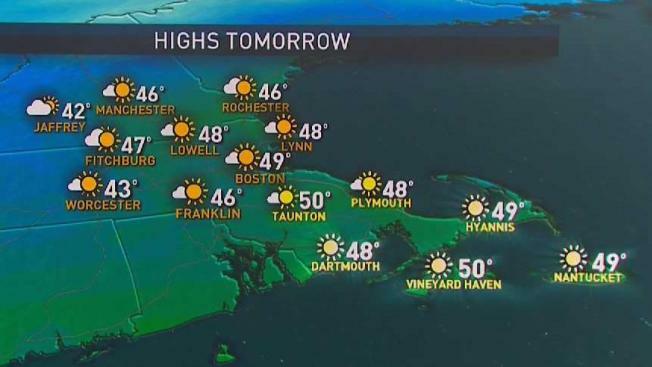 Right now, Thanksgiving looks quiet and chilly around New England.